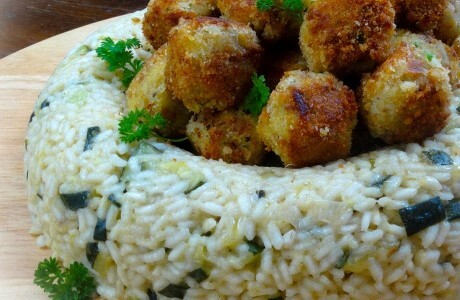 A fresh courgette risotto in a ring with crispy fish balls in the centre. It will look great on the table as well as being tasty and easy to make. A winning dish to serve at a dinner party. Visit My Little Italian Kitchen for recipes full of fresh, flavour-full, healthy and seasonal ingredients. How cooking should be! For the risotto: Make the risotto by finely chopping the onion and stir fry it in a pot with 2 tbsp of olive oil. Chop the courgettes and add them to the onion. Cook for 5-10 minutes until soft. Bring some water to the boil, add the rice to the pot with the courgettes and onion and brown it for a few minutes. Add salt and pepper, the vegetable stock and slowly add the water. Cook to al dente (according to packet instructions). Add water as it dries out. When it is cooked switch off the gas, add a knob of butter and two tbsp of parmesan, stir thoroughly. Cover with foil and leave to rest for 5 minutes. Tip the mould upside down on a serving dish and put the fish balls in the centre. Garnish with a few leaves of parsley.